When South Carolina Electric & Gas Co. began searching for an effective small-diameter PE squeeze-off and repair tool it went north—way north—to the manufacturing facilities of Footage Tools in Toronto, Canada. Footage Tools has made squeeze-off tools for PE pipe since 1982 and has a long history of delivering tools to the industry driven by their input and requirements. After several conference calls and studying various options available on the market, SCE&G asked Footage Tools to deliver a prototype tool for evaluation. Eventually, Charles Forsberg, general manager of System Engineering and Purchasing for SCE&G, felt they had a tool specifically designed for their operations. It offered the ability to safely and efficiently respond to a wide variety of field situations, he said. Next came the true test of the product in actual fieldwork. Stuckey Stoudemire, division manager, Gas Operations for SCE&G, was given the task of evaluating the C200. “We simply gave it to our gas journeymen and told them to use it. We listened carefully to their recommendations after about a month in the field, and passed all the comments back to the manufacturer.” Footage Tools incorporated SCE&G’s recommendations by taking the weight of the tool, adding a carrying handle for convenience, installing a grounding rod and cable and modifying the handle assemblies for ease of operations. “After we witnessed their response and commitment, we requested that they design a prototype of a smaller tool that would handle half-inch to one-inch CTS (copper tubing size) with a .090-inch wall thickness,” said Forsberg. Thus the C150 was developed. SCE&G has already taken delivery of 50 of these units in addition to 45 of the C200 model. The C200 features a lightweight, 5-foot tall aircraft-grade aluminum frame with a steel center feed screw, adjustable gauge plate for half-inch to two-inch diameter over squeeze protection, integral centering springs, an integral carrying handle at the balance point that doubles as a storage space for the optional grounding rod assembly, and a collapsible stabilizer handle. Another example where the C200 made its mark was in Charleston, SC. Here, one man with a posthole digger and the C200 was able to squeeze off a broken PE line in the middle of the night. By the time a construction crew arrived on the scene to make repairs, the situation was already safe. 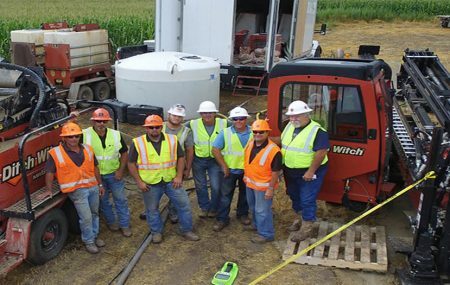 Pat Yaremko, sales, and marketing manager, PE products, of Footage Tools, said many employees from the utility participated in the venture, which made it a worthwhile learning experience for both vendor and customer. “We have a long history of relying on field feedback, but this project took on new dimensions as we progressed from a vendor-customer relationship to partners in the design of a new tool,” he said. A trend amongst multiple news outlets within multiple areas are seeing a trend in gas leaks; there’s more of them happening. Many are caused by accidents and unforeseen circumstances—where as others are due to older gas mains, as they will wear out over time. Despite this occurring in different places with different circumstances, the one commonality is it isn’t being talked about enough. We see small headlines with a brief synopsis of the situation, but no one is talking about prevention and solution. No one really talks about the professionals who can fix the problem, the first respondents who are there in case of an emergency situation or the suppliers who create products to ensure everyone can do their job safely and in turn provide safe homes and cities for the population. Two vehicles collided, with one spiraling into a home, severing a natural gas line. Police was immediately on the scene, controlling the accident and evacuating nearby homes. Utility crews contained the leak and repaired the severed line. An under the influence driver crashed into a home, causing a gas leak within the house. Troy Police on the scene assisted in evacuating the three residents and their three dogs within the home. At 3:35 am utility crews were working to shut off the line. Firefighters and police officers blocked roads and redirected traffic while a local gas service company repaired a leak. This was caused by a car reversing down a small alley and clipped the gas line. A nearby theatre had people exciting, but they were prohibited from retrieving their vehicles by first responders. Skilled and trained professionals should be the only ones repairing gas leaks in any given situation. With the proper equipment, knowledge and experience they will be able to correct the problem safely and efficiently. An ideal solution for emergency situations—The Remote Hydraulic Squeeze Off Tool from Footage Tools. The aforementioned tool is designed to control gas line breaks and distribution lines. 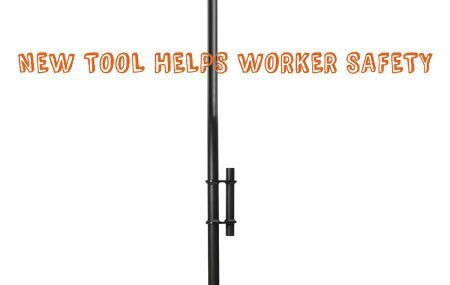 Its ability to pivot and extendable handle provides the operator with a safe working environment. For more information on how our tools can safely and efficiently get the job done visit our products page, send us an email or give us a call! The use of piercing tools has been an easy-to-use and cost-effective alternative to trenching for the past century. They are an ideal tool to use in the installation of utilities under existing landscapes and structures. Footage Tools’ pneumatic piercing tool the ‘Big Shot’ creates a compact hole that will allow contractors to install underground water, gas, irrigation, cable, fiber or electrical lines under buildings, streets and yards with little disruption to surrounding environment. Like all tools, however, you may experience some issues with use. This may be due to operational error or environmental surroundings. Check air compressor for proper air output (90-110 psi or 620-720 KPa). Improper or low air pressure setting can interfere with starting. Check that full pressure air is available at the tool and that the hoses and the fittings are of the correct diameter. Be sure to aim the hose away from yourself and other persons as high-pressure air can forcefully eject dirt or other materials. Take tool apart and clean it. Take off the air supply hose from the oiler to the tool and inject ½ oz (15cc) of lubricant directly into the hose itself. Turn air supply hose once counterclockwise to REVERSE if in FORWARD, or one turn clockwise to FORWARD if in REVERSE. Connect supply line to oiler and open-air control valve. If the tool does not start, repeat steps. If the tool fails to start after the above steps have been performed, return tool to your dealer for inspection. It is important to ensure that all air line couplings are tight and lock collars in place for this troubleshooting check. If the tunnel has collapsed on the air supply hose, turn air supply hose counterclockwise while the tool is running. The impact action of the tool will help loosen the stuck supply line. If unstable soil conditions have caused the tool to lose traction and oscillate, reduce air flow at the control valve until traction is regained. Unstable soil conditions included gravel, sand, watery slick clays, and soil under trees. Check air supply lines for possible obstructions. Ensure hose is in FORWARD. If the tool is oscillating, reduce airflow at the oiler valve. Soft or wet ground conditions can cause the tool to lose traction and oscillate. Put a reference mark on the hose to determine if the tool is moving. If the tool has hit an obstruction, rotate the hose counterclockwise 2 to 3 turns until the tone of the impact changes. Then turn hose in the clockwise (FORWARD) direction slightly, until the tone is gone. This provides a maximum impact force to break through an obstruction. If the tool is unable to break through, reverse tool direction and start a new hole away from the obstruction. It is important that when starting a new bore, the operator should move over a distance of 10 times the diameter of the tool so that the tool does not cross into the other bore. Perform the piston tip test: Tip the body from horizontal to approximately 22°. The striker should slide from front to back. A tool with high piston friction may have ingested dirt and should be taken apart before being used again. The tunnel behind the tool may have collapsed, restricting airflow. Step 1: Check air compressor for proper air output and pressure. Step 2: Check that the tool is using lubricant. Step 3: Turn or adjust tool air service line while the tool is moving forward or reversing. Step 4: Check that supply lines and fittings are properly sized. Step 5: Perform piston tip test. Step 6: Check striker wear ring end gap. 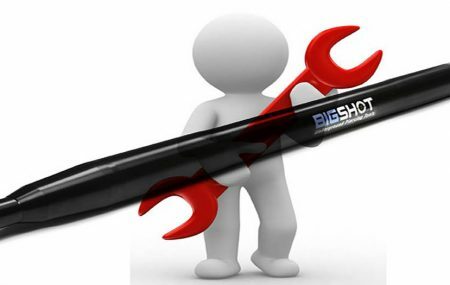 If you are still experiencing issues with your ‘Big Shot’ please contact your local Footage Tools distributor. © 2017 Footage Tools Inc.. All Rights Reserved.